In the minds of many cyclists, Sidi shoes are the gold standard by which all others are measured. Yet in stark contrast to the quality of the rest of the shoe, Sidi’s insoles are frankly subpar even when compared to shoes that cost half as much. Sidi has made some strides lately to bring the insoles to a level more befitting of such a premium shoe, but even in their flagship road shoe Wire, the effort is hardly remarkable. One of the better insole/footbed systems available is the Giro SuperNatural ($49.95), which has three sets of modular arch support that allows the rider to select the amount that serves the interface between foot and shoe. One problem in fitting an aftermarket insole into a Sidi Wire is that the sole of the shoe has holes in it feeding air through channeled vents. The stock insole has holes aligned with those in the shoe’s sole; Giro’s aftermarket insole does not. But I shall have my cake and eat it too. 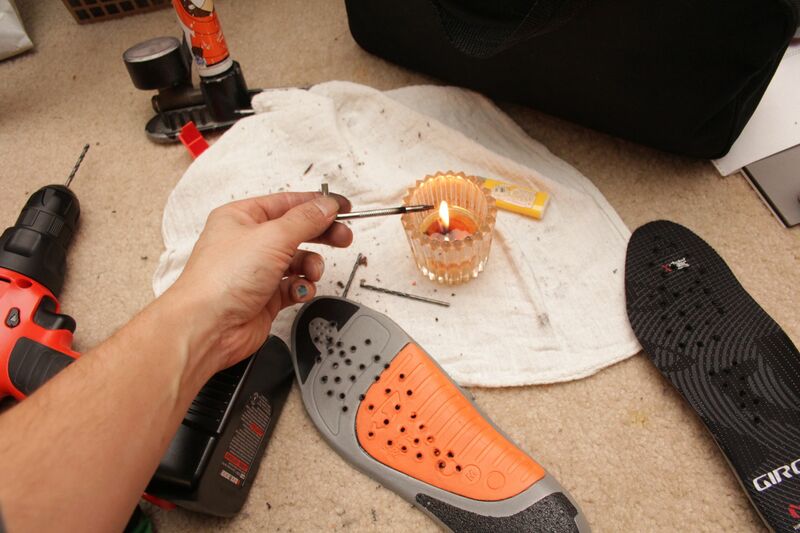 To put vent holes into the Giro insole, I first laid the stock insole over the Giro model, then marked the location of the holes into the new insole with a pen poked through the stock insole. Then I opened up a hole at each mark using a 1/8” drill bit on a small drill to bore through the Giro insole. The SuperNatural insole is primarily a firm, flexible foam pad that stretches around the bit rather than cutting into a smooth 1/8” hole. The X-Static fiber on the top surface of the insole also also ends of fraying a bit. So the next step is to make the hole bigger and seal the frays in the X-Static. The best way to seal frays in synthetic fibers is usually to singe them quickly. Heat can also be used to widen the holes in the foam without actually removing material from the insole; high heat just melts the foam a bit, which collapses away and leaves the hole bigger. I suppose a small tip soldering iron would have been a great idea, but I don’t own one. The tediously slow, primitive, yet effect way is to use some roundish steel pokey thing and heat with a candle. I used a Torx wrench that was surplus in my tool box. It’s so slow because I had to reheat the tip of the wrench in between each application to an individual hole, but it worked like a charm! Be aware that you’ll have to pause occasionally and let the whole wrench cool, because the portion of the wrench you’re grabbing eventually gets too hot to hold. The tactic I used was to concentrate heating about 1cm from the tip of the wrench so that the hottest part didn’t touch the insole first. Then I pushed it into the pre-drilled holes from the top of the insole, so that the X-Static melted frays of X-Static get pushed into the hole, not up at the foot. Then I hold the tool in there for about 5-10sec, letting the heat be absorbed by the foam. Then I pull the wrench out, giving a twisting motion. You may have to adjust technique and the amount of heat for a given insole’s construction.